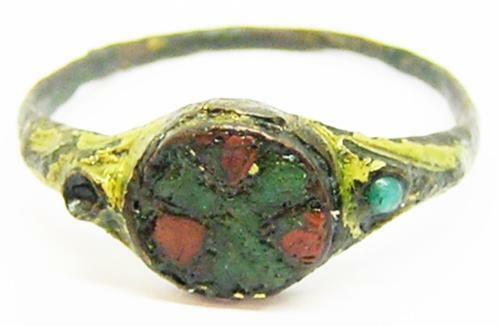 This is a rare Anglo Scandinavian enameled finger ring, dating to the 10th - 11th century A.D. This type of ring closely follows the same production as the enameled brooches of the same date, likely production centering around York and Viking held towns in England. The ring is produced from bronze, set with a cloisonné enameled bezel, the shoulders sculpted and set with a turquoise blue glass (one missing).The ring retains much of the original mercurial gold gilding, it is intact and in good excavated condition. DATE: c. 10th - 11th century A.D.